Kids today. It is amazing that they can survive with danger lurking around every corner. Cartwheels, handstands, somersaults, tumbling, three-legged races, and graduation hats are disallowed in some places because of the obvious danger of injury. (see links below) What is the latest thing that presents a real and present danger to the well-being of our children? Swimming goggles. The administration of the Yagoi Bryn Coch junior school in Mold, Wales has informed parents that their children will not be allowed to wear swimming goggles anymore. Why? Well, you see, plastic can get slippery when it is wet. This means that when a child pulls the goggles away from his face that he could accidentally slip and let go of the goggles. If the plastic lens of the goggle happens to break at that moment, the child could get plastic in the eye. Apparently overlooking the damage that chlorine can do to the eyes, Headmistress Lynne Williams said: "It has been recognized by the British Association of Advisors and Lecturers in Physical Education that goggles can pose a real risk to children." On the other hand, parents say that the ruling is "bonkers" and is "health and safety regulations gone mad." I guess the parents just don't care as much as the rule-makers. hmmmm. using this logic, children should not be allowed to swim at all. 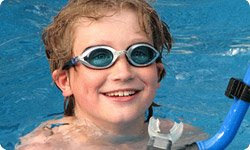 The number of kids who drown each year certainly exceeds the number of kids who go blind from their goggles. for similar posts about over-protection, click the "overprotection" label below or in the label cloud. OMFG! what is wrong with you people! Srsly the brits have gone mad. I guess this is what happens when you let your gubment make all of your decisions for you.